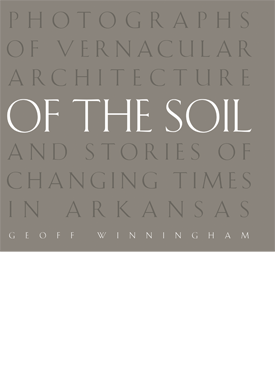 In 1980, photographer Geoff Winningham and architect Cyrus Sutherland traveled extensively throughout Arkansas to locate and photograph examples of southern American vernacular architecture. They were working on a commission from the First Federal Savings and Loan of Arkansas, and after a year they had finished their project. But, with their interest piqued and enjoying their collaboration, they continued on with the project in hopes of amassing a collection of photographs of vernacular architecture from every region of the state. For two more years, Sutherland continued helping Winningham find every possible “dogtrot house, wood frame church, octagonal barn, and one-of-a-kind hog house” in the state. By 1983 Winningham had photographed over three thousand structures, and the architect and photographer put the collection aside and moved on to other projects. Three decades later, after Sutherland had died, Winningham reopened his archive of Arkansas photographs, found his interest rekindled, and decided to return to the sites of the structures he had photographed. Most of the buildings, he discovered, had disappeared due to fires, storms, or neglect. But while Winningham was unable to find many of the structures he had photographed, what he did find were local people who remembered them. The stories of these local people join the original photographs in Of the Soil in a remarkable fusion that shows us much about the culture of the American South. Geoff Winningham holds the Lynette S. Autrey Chair in the Humanities at Rice University, where he has taught since 1969. He has published twelve books, including, most recently, Going Back to Galveston: Nature, Funk and Fantasy in a Favorite Place. His photographs are in many collections, including the Museum of Modern Art; the Metropolitan Museum of Art; the Museum of Fine Arts, Boston; the Museum of Fine Arts, Houston; and the Whitliff Collections.